Throughout its history, Corning Incorporated Foundation has been driven by making a positive impact on communities where its people work and live. A deep and thoughtful study that concluded in 2017 helped the Foundation take a fresh look at its communities, their assets and challenges, and ways that non-profit programs could foster the aspects that make them vibrant in today’s world. 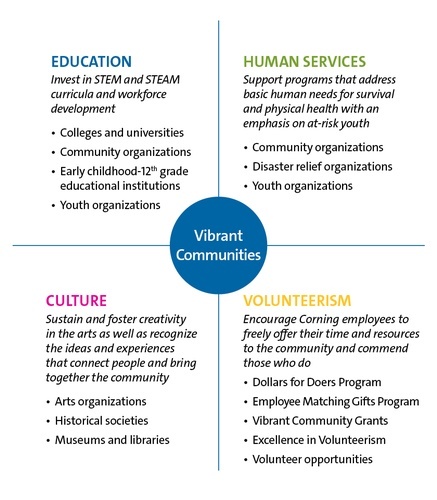 The comprehensive process led to the creation of a strategic framework that now guides the Foundation’s grant programs and ensures clarity of its mission: A focus on education, human services, culture, and volunteerism.